Ceann na Pairc Guest House is located in Nunton on the Island of Benbecula in the Outer Hebrides. The accommodation offers four en-suite bedrooms; three double and one twin/super-king, there is also a guest lounge. We aim to provide good quality comfortable accommodation for tourist & corporate guests. We are situated centrally, one mile from the airport and three quarters of an hour drive from each ferry port. We are also close to shops and restaurants, and just a short walk away from a beautiful beach. 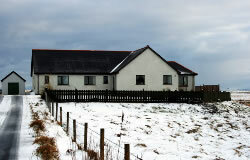 The accommodation is on a working croft and there is ample wildlife and birdlife in the area. We aim to provide a home away from home feeling for our guests offering comfortable and modern guest accommodation; Our rooms have TV/DVD player with satellite television & hospitality tray, all rooms have en-suite showers rooms. For guests who bring their own wifi-enabled laptops broadband access is available in all bedrooms as well as a guest lounge. Outside we have a vast decked area and garden which guests are welcome to use during their stay. We also offer storage for bicycles and fishing gear. Whether you like a hearty cooked breakfast or just something light, every taste is catered for. In the afternoon, teas, coffees & “something sweet” (usually home baking) will be available for guests in the dining room.